I finally figured out the best name for this color I got with the cochineal. Raspberry. Or rose. But rose might denote a paler color. Anyway, I’ve been very busily working away on the shawl-neck sweater. Here’s what I’ve got so far. Actually, I’ve done more since this picture was taken, but it’ll give you the general idea. I’m really pleased with the way it’s turning out. At first I wasn’t sure I like how it looked, but it’s grown on me. I think that it’ll look even better once it’s blocked. I tell you, this pot of dye was like the Energizer Bunny! It just kept going and going and going! The first batch of wool came out a sort of mauve color. And the bag seemed to have worked! Then I popped in a second batch to see if I could get a lighter shade for two-tone purposes. Here are some of the first skeins of the plied merino yarn. Is it not gorgeous? When it came off the swift I had one of those “oooooooohhhhhhh” moments. A moment only equaled to . . . um . . . well, I’ll figure something out. Norwegian is finished! All thirteen ounces of it spun up into six nice skeins. Don’t ask me about the yardage; I don’t know. This yarn is destined for Kool-Aid dyeing (assuming nothing goes wrong), and hopefully it will find a happy home. It is now sitting on the drying rack, along with as many other yarns as I could fit. The New Year’s Dash worked great, but I wound up with tons of yarn to set the twist in. And I’ve started on the merino roving. I’m spinning it into a two-ply sport weight, which I will dye a deep shade of red (using cochineal!) and then crochet into a sweater type thing. I seem to recall hearing silk referred to as the queen of fibers. If that’s the case, I heartily agree. I’m getting more and more in love with silk. The way it drafts, the way it shines, the way it swirls into a colorful rush of beauty . . . and that sounds like some really weird love song. But, I have proof that it swirls into a colorful rush of beauty! See? 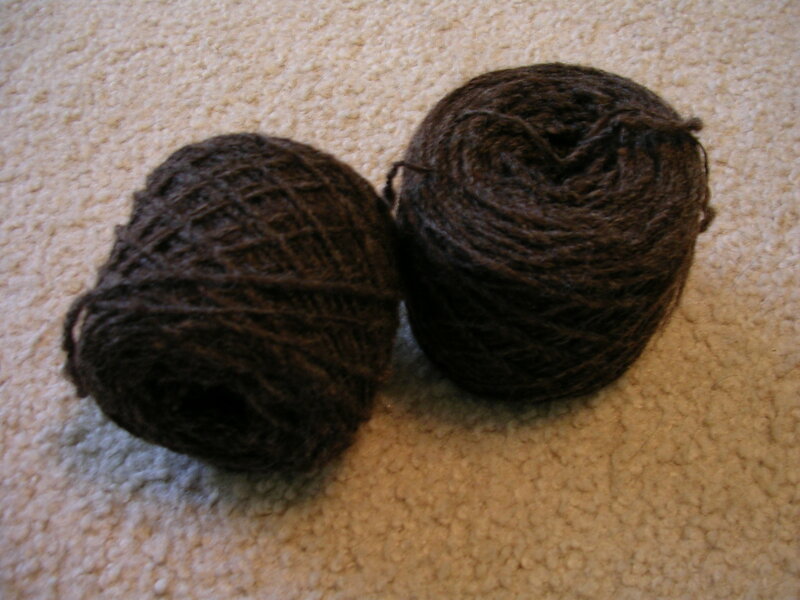 The roving that I ordered from Paradise Fibers (along with the swift and un-dyed sock yarn) finally arrived! It was back-ordered at the time I bought it. 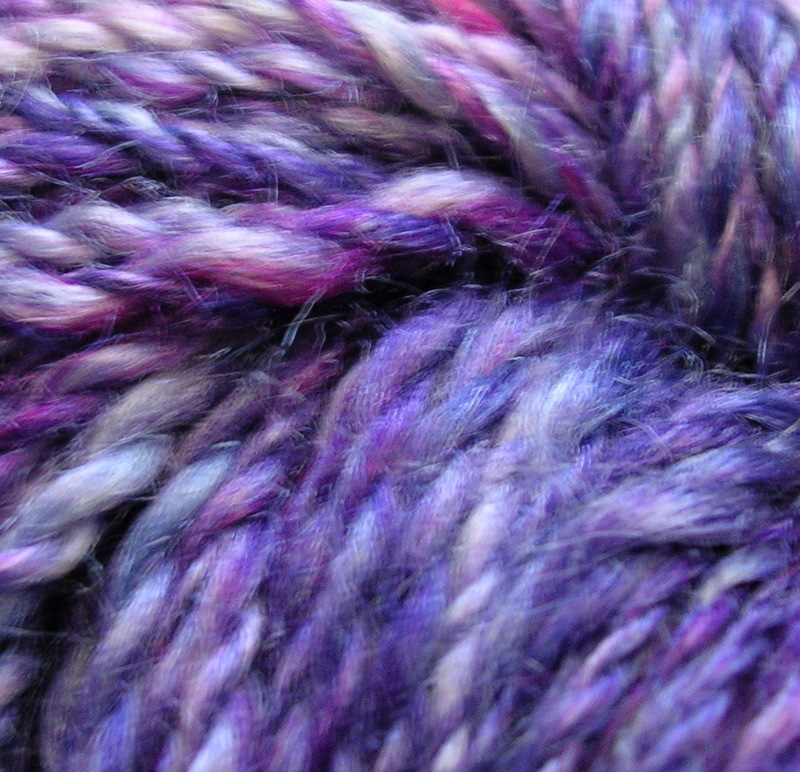 It’s a beautiful, dark Coopworth roving. And it looks and feels like it was a carded roving, which is nice because that’s what I’ve been practicing spinning lately.